(10% ) Problem 7: An infinite conducting cylindrical shell of outer radius ri-0.10 m and inner radius r2 0.08 m initially carries a surface charge density 0.15 μC/m2 A thin wire with linear charge density 1.3 μC m s nserted along the shells' axis. The shell and the wire do not touch and these is no charge exchanged between them Banchi, Stephen - banchis3@students.rowan.edu @ theexpertta.com - tracking id: 2N74-2F-82-4A-BAAB-13083. In accordance with Expert TA's Terms of Service. copying this information to any solutions sharing website is strictly forbidden. Doing so may result in termination of your Expert TA Account. 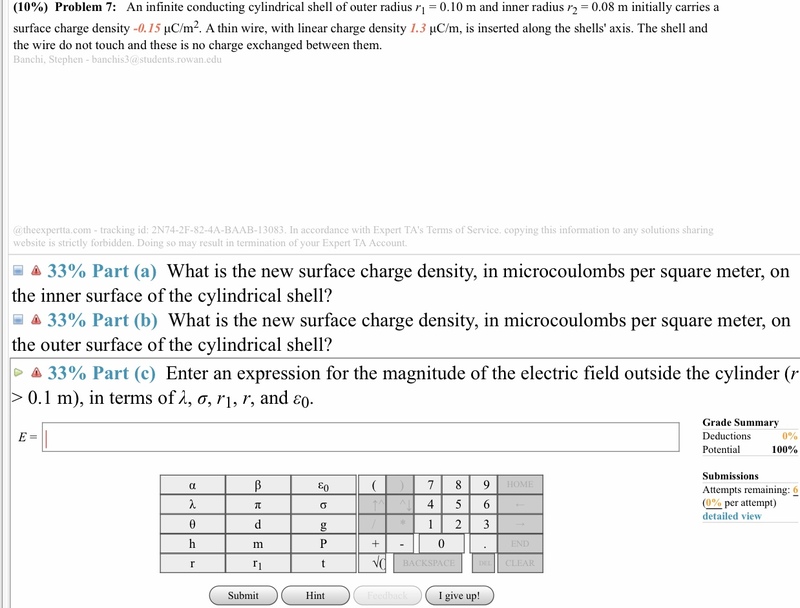 -a33% Part (a) What is the new surface charge density, in microcoulombs per square meter, on the inner surface of the cylindrical shell? -là 33% Part (b) What is the new surface charge density, in microcoulombs per square meter, on the outer surface of the cylindrical shell? 33% Part (c) Enter an expression for the magnitude of the electric field outside the cylinder (r > 0.1 m), in terms ofA, σ, ri, r, and 0. Grade Summary Deductions Potential 0% 100% Submissions Attempts remaining:6 (0% per attempt) detailed view HOME 4 5 6 r1 BACKSPACE CLEAR Submit Hint I give up!